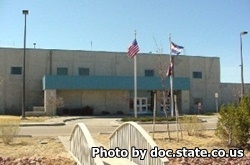 Sterling Correctional Facility is located in Sterling Colorado. It is a Level V facility with a capacity to house 2,500 inmates. The offenders housed at this facility vary in custody levels. Depending on the custody level of the inmate and the incentives they are eligible for they may be able to participate in a wide variety of programs, education and vocational classes. The ultimate goal of this institution is to provide rehabilitation and successful reintegration of the inmate back into society. In order to do this, inmates are encouraged to participate in a variety of programs and classes that will improve their knowledge and skill sets. Inmates can train for computers and electronics systems, food production, welding, masonry, carpentry, construction and heavy equipment operation. The visiting day and time will depend on which unit your inmate is located in. All visits must be scheduled over 1 week in advance by calling (970)-521-8300. Can I write a inmate a letter in pencil?